Product code: R414 Categories: Sold Items, Sold Rings. Although worn to remember the passing of a loved one, antique mourning jewellery should not be looked upon as being sad or morbid, but rather a way to remember and celebrate the life of someone close to you. And it must also be remembered that this form of jewellery was done at a time when this was really the only way to remember a loved one. So it really is special when you see a gorgeous antique mourning ring from the Georgian era that was made nearly 200 years ago that is still in such wonderful condition. 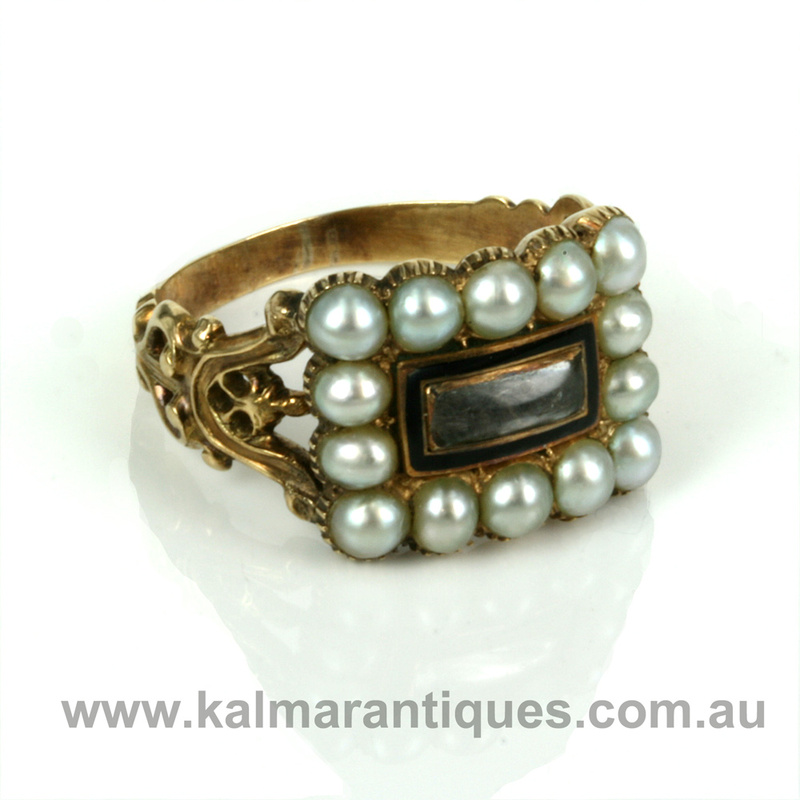 This particular mourning ring was made in 12ct gold and is set with 14 natural pearls in a rectangular “border” that surrounded a line of black enamel and in the centre a lock of woven hair under a piece of clear rock crystal. The border of pearls measures 15.8mm across by 13.3mm and leads to the most beautiful scroll sides that was so expertly created. Antique mourning rings seem to have a charm and character all of their own, and when you place a ring on your finger that is close to 200 yers old, it really does feel so special.